Greek fire. Damascus steel. These are two technological innovations whose secrets are said to be lost to time. Even the original schematics for the Apollo missions have disappeared into the mists of history, forever hidden inside hopelessly obsolete computers. How do we lose technologies that were once so important? Some say that they aren't really lost, and are working on rediscovering them. Certainly, the specific techniques and materials required to construct some of the famed inventions of the ancient world (and the late 1960s) can be lost. And it's definitely true that people can forget how some ancient invention works for hundreds, even thousand of years. But the history of technology is very much the history of ideas, and as you'll see, ideas are pretty much indestructible - even in the face of truly terrible record keeping. It's useful to think of the famous examples of lost technology in terms of a few distinct categories. First, let's consider the most famous lost technology of them all, the ancient Byzantine incendiary weapon Greek fire, a unique chemical formula that produced inexhaustible flames. This terrible weapon was a closely guarded military secret of the Eastern Roman Empire, and its fearsome effectiveness in battle arguably extended the life of the empire by over 500 years. The first mention of Greek fire in combat comes from the early 9th century historian Theophanes, who in his Chronography tells of its use against invading Arab forces about 150 years before. At the time, the once mighty Byzantine Empire was falling to the invaders, with enemy navies besieging the capital of Constantinople for five years. According to Theophanes, the desperate emperor Konstantinos IV was approached by a Greek architect - and, presumably, chemist - named Kallinikos, who had fled his home in Syria to escape the invading Arab armies. Kallinikos showed the Byzantine armies how create Greek fire, which was put to use in a naval battle around 678 CE. As Theophanes tells it, the Eastern Roman forces found themselves overwhelmed by the vast Arab fleet under the command of Khalif of Syria. But the Byzantine ships piped their Greek fire through the newly attached siphons out onto the water, where it burned and consumed everything in its path. The enemy found that nothing could extinguish the flames of this strange fire, except sand, vinegar, or urine, preferably old. The Arab navy was crushed, and the imperial capital of Constantinople survived its brush with destruction. Greek fire would save the empire from Syrian invaders once again in 717, and the Empire - and perhaps all of Europe along with it - was once again secure. While the basics of the story are probably true, the Phoenician architect Kallinikos probably didn't invent Greek fire, and it's entirely possible that he didn't even exist. Greek fire was more likely the product of many people with knowledge of chemistry working over decades, perhaps even centuries to refine it into the perfect formula. There's evidence of chemical-based incendiary weapons going all the way back to the 9th century BCE, and plenty of other ancient powers had chemical weapons along the same lines. But the Byzantine version was easily the most fearsome of all, and the one whose secrets of production were the most jealously guarded. Part of the reason that Greek fire has passed into legend is that it was a great mystery even in its own time. 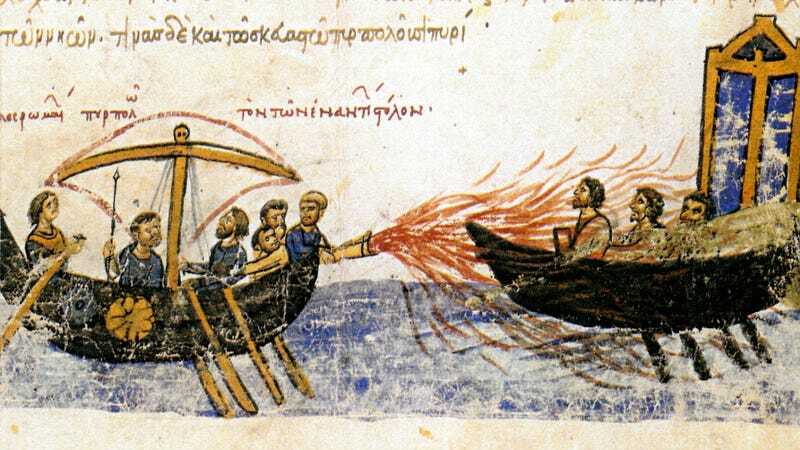 Although the Greek fire deployed by the Byzantines in later centuries probably was not precisely the same thing as the original formula attributed to Kallinikos, Greek fire was always a devastating weapon that could turn the tide of any naval battle. This gave Constantinople a terrific advantage over any foe, and there's no question that every other great power coveted Greek fire and yearned to know its secrets. And yet, for over five hundred years, nobody ever learned its secrets, until even the original keepers of the knowledge died out. What's more, Greek fire never even fell into enemy hands. In 814 the Bulgar nomads captured thirty-six siphons and enough Greek fire to devastate an enemy force. And yet all the evidence suggests this captured fire lay unused because the Bulgars couldn't even figure out how to make it work. Greek fire was not just an incendiary. It was a weapon system, composed of dromon, tube, caldron, and liquid. To steal the secret it was necessary to steal all the components. But people with knowledge of the components were never in the same place at the same time. Shipwrights built the dromons at shipyards in Constantinople and other ports. Smiths who installed the caldrons and perhaps the siphons worked in different parts of those same shipyards. Most probably the workers in bronze who made the siphons were different from the ironworkers who made the caldrons. None was in touch with the chemists in the main arsenal of Constantinople who brewed the liquid. It is possible that none of these artisans ever met the siphonators who were trained to work this weapon system at sea. The Byzantines compartmentalized knowledge of their system so that no one likely to fall into enemy hands would carry more than a fraction of the secret. The traditional accounts say that the complete secret was known only to two families, that of the ruling imperial dynasty and a second, otherwise unknown family referred to as Lampros. Such monopolies of knowledge were common in Constantinople, and it likely protected the knowledge of Greek fire from ever reaching wider circulation, but it also had a major vulnerability - if anything happened to the transmission of the secret from one generation to the next, Greek fire would be lost forever. Much like its western counterpart, the Eastern Roman Empire was notorious for the short reigns, violent deaths, and constant overthrows of its emperors, and the these constantly interrupted successions meant the knowledge of Greek fire was lost by 1204, if not long before. The mysterious Lampros family also likely perished in these constant intrigues and rebellions. Whether Greek fire is still a lost technology or not is, to some extent, a matter of interpretation. Certainly, the precise formula, materials used, and methods used to unleash Greek fire are lost, and it's unlikely they will ever be recovered. But the fact is, historians and scientists know enough about Greek fire to make some pretty shrewd guesses about what Greek fire was, and the chances are that one of the many attempts to recreate it have more or less stumbled on the secret. And anyway, the underlying technology of Greek fire has been reinvented many times since Kallinikos. Let's back up a moment. The ancient accounts all seem to agree on a few crucial points. The fire burned on water - some claimed the water actually ignited it - and it was only those old standbys of vinegar, sand, or urine that could put it out. There's general agreement that Greek fire was a liquid of some sort, and that when it was released it created a loud noise and some smoke. Assuming those descriptions are all accurate - and there's nothing generally consistent ancient accounts for us to feel confident on that score - then we've already narrowed down the possibilities as to what Greek fire could be, at least in terms of its primary ingredients. To have all those qualities, Greek fire almost certainly used crude oil, which could be found in wells all around the Byzantine-controlled Black Sea. Other chemicals were likely mixed in with the petroleum to give Greek fire its unique characteristics, and of course that still leaves the crucial matters of its production and handling that helped to make the weapon so baffling to Constantinople's enemies. Those are important details, to be sure, and if ever there was a technology that we could call lost, then Greek fire is as good a choice as any. But it's only the very specific details of Greek fire that are lost - we long ago rediscovered how to make a devastating, petroleum-based fire that will burn on water. That would be napalm, and for better or worse it does its job just as well and in much the same way as Greek fire did. Greek fire is the clearest example of what we could call a lost technology, but it's hardly the only one. For 2,000 years, the finest steel in the world was known as Damascus steel, which were known for their distinctive patterns, extreme toughness, and ability to be honed to the sharpest of edges. The legends that sprang up around Damascus steel claimed it cut a strand of silk in half as it fell to the ground and even cut through other swords without losing its sharpness. These stories outstripped the steel's actual abilities, but not by much. The exact method of producing Damascus steel was a trade secret among Middle Eastern swordsmiths, although we're fairly sure the steel was made from ore deposits originating in India and Sri Lanka. These deposits likely began to run out in the early 1700s, bringing an unceremonious end to a metalworking tradition that dated back twenty centuries. Exactly why the knowledge of how to make Damascus steel disappeared so completely and totally is difficult to determine, but researchers have suggested the unique properties were the result of very precise trace impurities of elements like tungsten or vanadium in those specific ores, and there was no point trying to make Damascus steel with anything else. If that's the case, then Damascus steel is a good example of a second big category of forms of lost technology, which are those that rely on materials that are no longer available. An other example, funnily enough, might be the Stradivarius violins, the perfect harmonics of which have been attributed not just to the master craftsmanship of Antonio Stradivari and his two sons, but also to the wood they were made from. Researchers Lloyd Burckle and Henri D. Grissimo-Mayer argued in 2003 that the wood was unusually dense because it grew during the Little Ice Age, a centuries-long period of unusual cold in Europe in particular. That's one possible explanation for the perfection of these violins - modern reproduction attempts may reveal more. Returning to Damascus steel, this is another case where, like Greek fire, the underlying technology is already broadly understood, and arguably better understood now than it was by its makers. Indeed, one theory to explain the unusual toughness of this steel is the presence of tiny nanowires and carbon nanotubes that formed inside the swords, which would have added tremendous strength to the swords but likely would not have been a well understood phenomenon hundreds of years ago. The particular combination of source material and steel-working technique has been lost in time, but we now know how to make steel that matches and indeed far exceeds its Damascus predecessor. Under those circumstances, it's again a matter of opinion whether we're really looking at a lost technology. All the potentially lost technologies we've considered came from ancient times, and so there have been centuries, even millenniums, for these inventions to be lost in the mists of history. But what about something much more recent, something less than 50 years old? That's the claim that has sprung up around NASA's Gemini and Apollo programs. You may have heard this story - the scientists and engineers moved so fast in their quest to put astronauts on the Moon that they didn't bother to keep good records, and so many of the plans and schematics for the technology they created have subsequently been lost. What's more, some of the computers that hold the vital information are so old and impossibly obsolete by modern standards that we now have no way to access them. If anything's missing, it's actually more the explanation. I mean there is some stuff that will never be found again, but it's all there, and the stuff that isn't you can sort of figure out backwards. Sometimes you need the equivalent of a Rosetta Stone, because sometimes the way we think today is not the way they thought back then. Sometimes you need an index or a document that explains how they did things or their nomenclature. That's the one thing that's sometimes hard to find is what I call a bridge document, an answer guide to how they did the thing back in the sixties. There's no FAQ. That statement actually applies to a lot of other mysterious forms of technology, like the Antikythera mechanism or the Baghdad batteries, both of which are over 2,000 years old. We know the former was used to calculate astronomical positions and the latter might have been used as some very primitive form of galvanic cell, but there's so little context or explanatory information for what their creators were thinking that they become baffling to us. None of this is meant to minimize the impressiveness of these technological feats, whether it's calculating the heavens 2,000 years ago or sending astronauts up into it 45 years ago, but simply that these technologies aren't ever truly lost. They are ideas, sometimes forgotten and waiting to be rediscovered - and we have proven ourselves extremely talented at reigniting the fire, Greek or otherwise, of forgotten ideas. Greek Fire from the Codex Skylitzes Matritensis via Wikimedia. "The Entry of the Crusaders into Constantinople" via Wikimedia. Damascus steel knife by DrBacchus on Flickr.